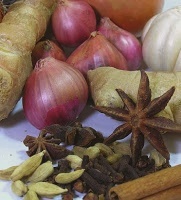 Many Malay dishes revolve around a Rempah, which is a spice paste or mix similar to an Indian Masala. Rempahs are made by grinding up fresh and/or dried spices and herbs to create a spice paste which is then sauteed in oil to bring out the aromas. Satay – These delicious skewered meats are a favourite of many and are perfect served with a fresh salad of cucumber and onion plus spicy peanut sauce! Rendang – This dry coconut-based curry generally features beef gently simmered until tender with hot and tangy spices and cooling coconut milk. Laksa – This is a noodle dish with a tasty and tangy fish soup which uses tamarind to great effect.